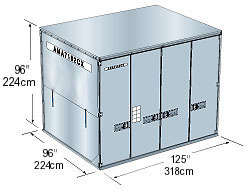 The following is a brief description of the various air freight containers. Max External Dimensions: Base - 47"x 60.4" x 64"
Max. External Dimensions: Base - 61.5" x 60.4" x 64"
Max. External Dimensions: 96" x 60.4" x 64"
Max. External Dimensions: 125" x 88" x 63"
Max. External Dimensions: Base - 96" x 60" x 64"
Max. External Dimensions: 125" x 60.4" x 64"
Max. External Dimensions: 125" x 60" x 64"
Max. External Dimensions: 96" x 125" x 96"